Bryn means Hill in Welsh and this hut is half way down a steep hill on our 5 acre smallholding. Parking is at the top of the hill, so you may need your wellies on arrival if the grass is wet. Bryn has a lovely, comfy kingsize bed, with white cotton bed linen, where you can lie and look out at the Welsh sky. Under the bed there is some storage space where you will find blankets and cushions for getting cosy outside, plus a few books and games. There is a bijou kitchen which has a cooker, sink and fridge with a small ice box section. You’ll find enough cutlery, crockery, glasses, pots and pans to prepare a simple meal for two. There’s a trendy eclectic mix of the vintage and the modern! Washing up liquid, sponge and tea towels are provided. Bryn is on mains water and electricity. It has bottled gas for the cooker and hot water. There is a wall-mounted electric heater in the main room and a heated towel rail in the bathroom to keep you warm and snug on chilly days. There is an ensuite with shower, loo and basin. Towels, a bath mat, soap and a couple of loo rolls are provided. A small wardrobe in the bathroom allows some storage space for you and there are lots of hooks for coats etc. You’ll find a couple of torches hanging up just inside the door. Outside there is a bench and a firepit. A BBQ and cooking tools can be found in the little storage shed. A starter pack of firewood and charcoal are also in there. To get Bryn into position with a good view, we created a bank for it to sit on. 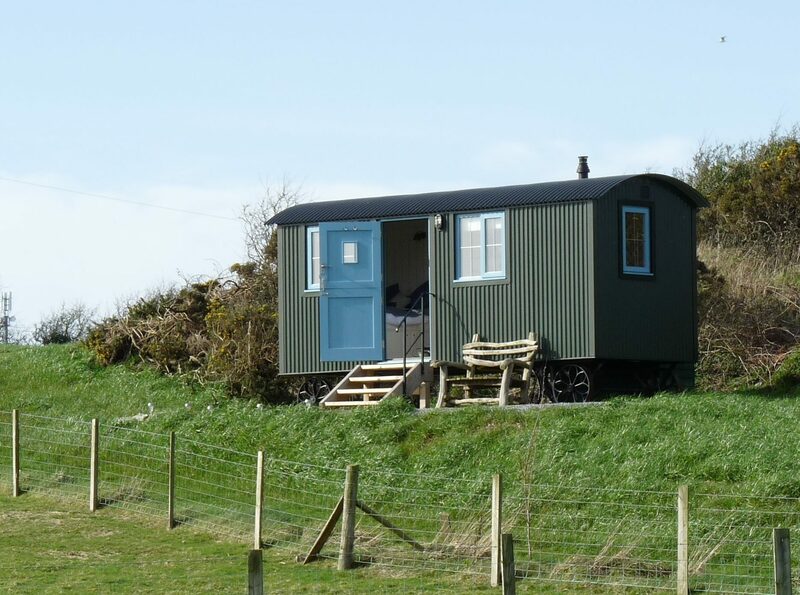 This does mean that there is a steep slope just outside the hut – so you’re welcome to use a flat clearing on top of the hill where you will find a picnic table, space to relax on the grass and great views to Snowdonia. After a day trekking along the coastal path or exploring historic ruins, light the firepit, wrap up in a vintage blanket, toast some marshmallows and watch the moon rise over the mountains.